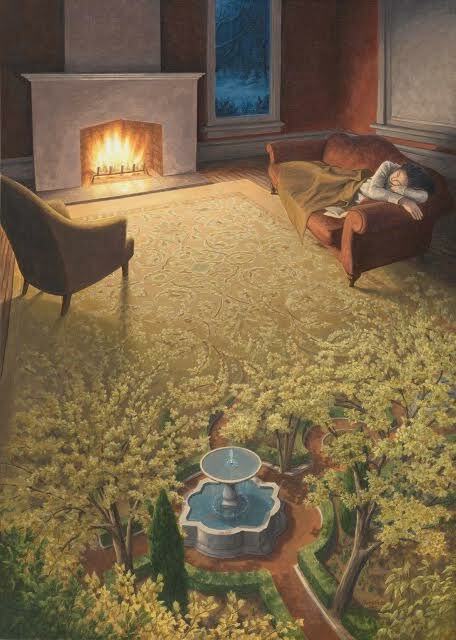 At the top of this painting created by Rob Gonsalves, a lady is napping on a couch under a blanket while enjoying the warm heat being thrown off by the nearby fireplace. 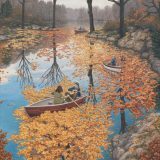 If you look at the bottom of painting, it appears to be a scene from a park with trees, paths, bushes, and a water fountain. 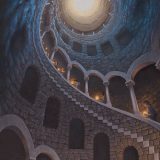 Rob Gonsalves was able to merge these two scenes together where the rug in the room at the top of the painting transitions into the water fountain scene seen below. 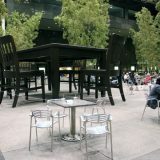 The end result is a confusingly ambiguous painting where two different realities co-exist.